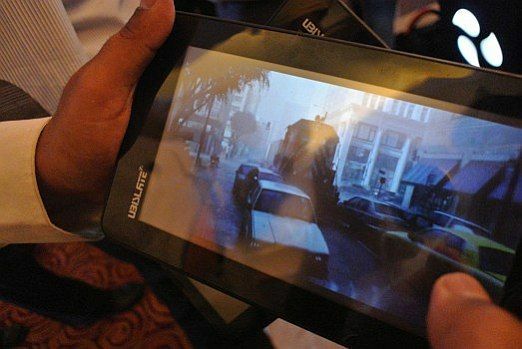 DataWind, the makers of the Aakash tablet, has launched two new tablets – UbiSlate 7 and UbiSlate 7C. The new DataWind tablets come with similar set of specifications, other than the display quality and internal storage. The Ubislate 7C, also touted as the commercial version of the Aakash II tablet, is priced at Rs. 3,999, while the UbiSlate 7 comes for Rs. 2,999. We bring you a hands on with the new UbiSlate 7C. Read on. The ultra low-cost UbiSlate 7C tablets are meant for students. 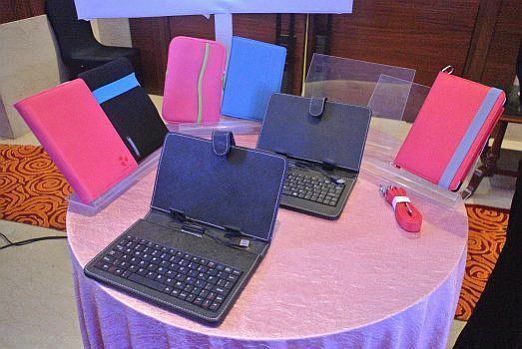 DataWind says its new UbiSlate tablets will help bridge the digital divide in the country. The new UbiSlate 7C and UbiSlate tablets comes with a range of educational applications, including soft copies of C.B.S.E text books. 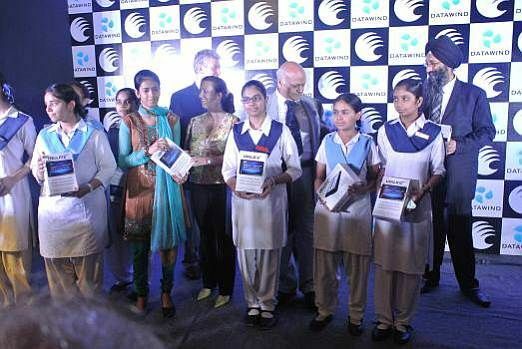 DataWind has also partnered with several content providers for providing educational content on the device. 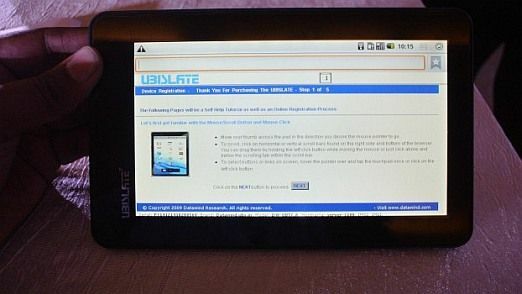 The UbiSlate 7 also comes pre-loaded with Wikipedia app. Both the DataWind tablets come with similar set of specifications, other than the display quality. The UbiSlate 7 has a seven-inch resistive touchscreen, while the UbiSlate 7C has seven-inch four-point capacitive touchscreen. DataWind's UbiSlate 7C has SIM functionality that extends to voice calls. DataWind CEO Suneet Singh Tuli took a dig on Apple's iPad, saying even iPad cannot make calls. He also said there's no seven-inch Android smartphone in the market at such a jawdropping price. 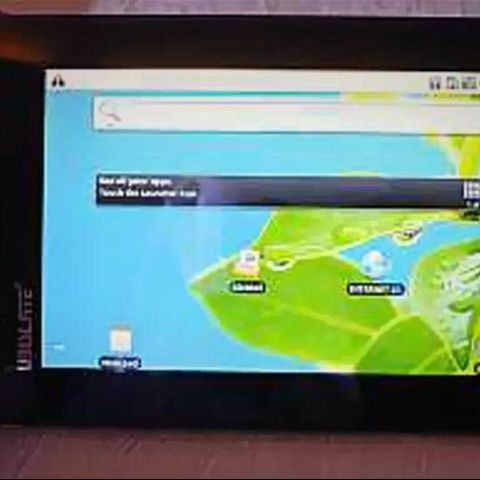 The UbiSlate 7C runs on Android 2.3 Gingerbread operating system. However, the device shown at the launch event was running on Android 2.2 Froyo. We were told the tablet will soon get upgraded to Gingerbread. 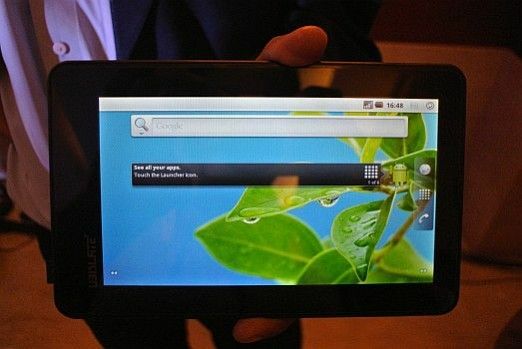 The Aakash tablet will be out with Android ICS OS; thus we can expect the UbiSlate 7C to get the ICS update in near future as well. 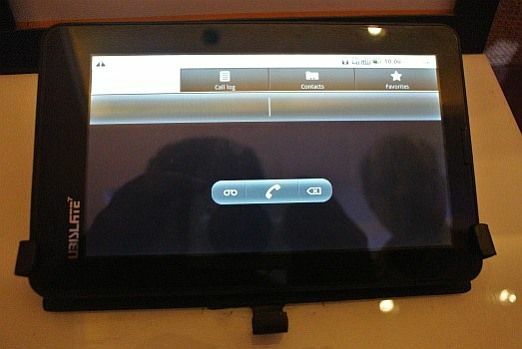 We tried to see how is the multimedia experience on the UbiSlate 7C. Unfortunately, there were no images in the gallery. 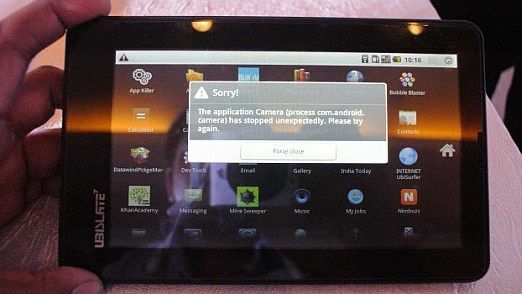 Moreover, the UbiSlate 7C does not have a camera. Inclusion of a camera feature could have added more value to the ultra low-cost device. The UbiSlate 7C can play HD videos as well. But the reflective screen may spoil the fun, as you can see in the image above. 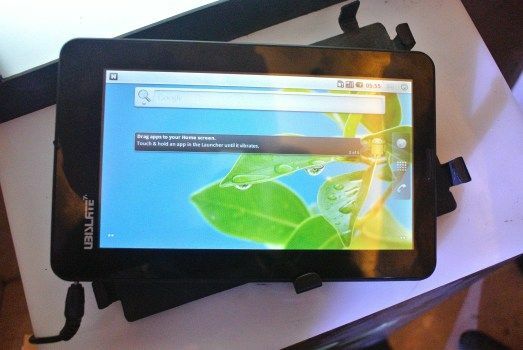 The UbiSlate tablets are exclusive devices to come with DataWind's UbiSurfer browser, based on 18 international patents that can deliver Internet access on traditional GPRS networks. DataWind says its UbiSlate 7C loads web pages faster even on GPRS connection and also reduces data consumption. UbiSlate 7C features internal flash memory of 4GB where the other model UbiSlate 7 has only 2GB memory. In the image above you can see, there's the slot for more storage. 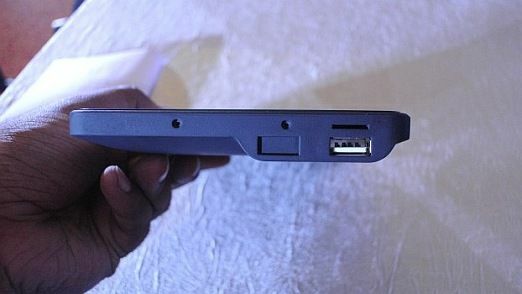 Below is the full-sized USB port. You can connect extra USB keyboard to make typing easier. DataWind's USB keyboard is priced at Rs. 500. DataWind is also offering a range of accessories with the new UbiSlate tablets. 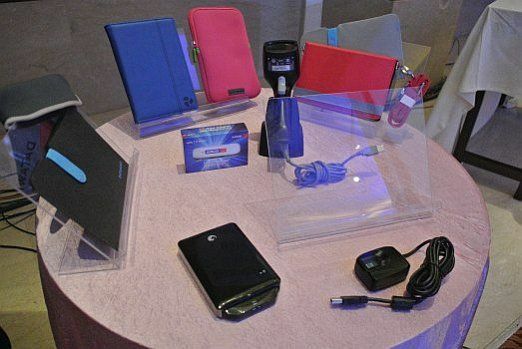 The UbiSlate 7C can be attached to a biometric read, Barcode scanner, external hard drive and a solar charger as well. For web browsing, you can get Aircel's 3G dongle as well.